The diagram below shows the initial position of the attackers in black and defenders in white, with the king in the center marked by a bold cross. The guards (mentioned by a light cross) occupy the four points non-diagonally adjacent to the king initially but are shown on the diagram otherwise as ordinary defenders. The king, guards and defenders are controlled by the defending player, and the attackers are controlled by the attacking player. The attacking player moves first and play then alternates with each player moving a single piece each turn. i.e., any point within the marked squared square of four points at any corner of the board. All pieces-- the king, guards, defenders and attackers alike-- move much like rooks in Chess. Specifically, a piece may move any natural number of spaces horizontally or vertically (but not diagonally) in a uniformly straight line. A piece may neither jump another piece (or empty point) nor occupy the same position as any other piece. No piece other than the king-- whether attack, defender or guard-- can occupy or pass over the center position or any of the four points of the citadels, i.e., the square of four points marked at each corner. then the enemy piece is captured and removed from play. Multiple captures are made simultaneously if the situation applies on more than one side of the piece moved. Neither piece involved in making the capture can be either a guard or the king. 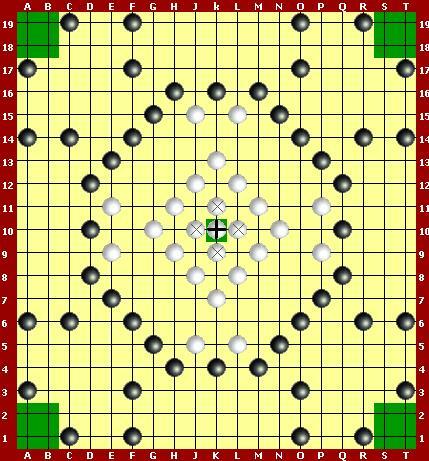 Either player may use either the center position (if unoccupied) or one of the points of a citadel in lieu of a friendly piece in making a capture. The guards cannot be captured and removed from play, but the attackers are free to immobilize any number of guards by blocking them on all sides so that they are unable to move. Finally, the king is captured if he becomes immediately surrounded on all four sides (excluding diagonals) by attackers. If the king is against the edge of the board, attackers need only occupy the three remaining points immediately adjacent to the king horizontally or vertically (again not diagonally). The center point of a point of one of the citadels may also be used in lieu of an attacker in capturing the king.